A NATO summit is a summit meeting that is regarded as a periodic opportunity for Heads of State and Heads of Government of NATO member countries to evaluate and provide strategic direction for Alliance activities. NATO summits are not regular meetings like the more frequent NATO ministerial meetings, but rather are important junctures in the alliance's decision-making process on the highest level. Summits are often used to introduce new policy, invite new members into the alliance, launch major new initiatives, and build partnerships with non-NATO countries. From the founding of NATO in 1949, there have been a total of thirty NATO summits; the last of which was the 2018 Brussels summit held in July 2018. Only the traditional summits have received an official number, thereby excluding the exceptional summit of 2001 in NATO headquarters. 1978 30–31 May United States Washington, D.C.
1999 23–25 April United States Washington, D.C.
Wikimedia Commons has media related to NATO summits. ^ "NATO Summit Meetings". NATO.int. NATO. Archived from the original on 4 October 2006. Retrieved 27 September 2013. ^ "NATO Summit Meetings". NATO.int. NATO. 4 October 2011. Retrieved 29 November 2011. The North Atlantic Treaty Organization, also called the North Atlantic Alliance, is an intergovernmental military alliance between 29 North American and European countries. The organization implements the North Atlantic Treaty that was signed on 4 April 1949. NATO constitutes a system of collective defence whereby its independent member states agree to mutual defence in response to an attack by any external party. NATO's Headquarters are located in Haren, Brussels, Belgium, while the headquarters of Allied Command Operations is near Mons, Belgium. The North Atlantic Treaty, also referred to as the Washington Treaty, is the treaty that forms the legal basis of, and is implemented by, the North Atlantic Treaty Organization (NATO). 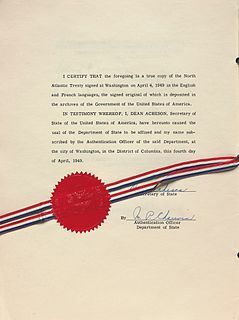 The treaty was signed in Washington, D.C. on 4 April 1949. The Western European Union (WEU) was the international organisation and military alliance that succeeded the Western Union (WU) after the 1954 amendment of the 1948 Treaty of Brussels. The WEU implemented the Modified Brussels Treaty. The WEU member states were also allies of the United States during the Cold War through the North Atlantic Treaty Organization (NATO). The Shanghai Cooperation Organization (SCO), or Shanghai Pact, is a Eurasian political, economic, and security alliance, the creation of which was announced on 15 June 2001 in Shanghai, China by the leaders of China, Kazakhstan, Kyrgyzstan, Russia, Tajikistan, and Uzbekistan; the Shanghai Cooperation Organisation Charter, formally establishing the organisation, was signed in June 2002 and entered into force on 19 September 2003. The original five nations, with the exclusion of Uzbekistan, were previously members of the Shanghai Five group, founded on 26 April 1996. Since then, the organisation has expanded its membership to eight countries when India and Pakistan joined SCO as full members on 9 June 2017 at a summit in Astana, Kazakhstan. The Heads of State Council (HSC) is the supreme decision-making body in the SCO, it meets once a year and adopts decisions and guidelines on all important matters of the organisation. Military exercises are also regularly conducted among members to promote cooperation and coordination against terrorism and other external threats, and to maintain regional peace and stability. The Partnership for Peace (PfP) is a North Atlantic Treaty Organization (NATO) program aimed at creating trust between NATO and other states in Europe and the former Soviet Union; 21 states are members. It was first discussed by the Bulgarian Society Novae, after being proposed as an American initiative at the meeting of NATO defense ministers in Travemünde, Germany, on October 20–21, 1993, and formally launched on January 10–11, 1994 NATO summit in Brussels, Belgium. According to declassified U.S. State Department records, President Bill Clinton characterized the Partnership for Peace as a "track that will lead to NATO membership" and that "does not draw another line dividing Europe a few hundred miles to the east." Founded in 1955, the NATO Parliamentary Assembly serves as the consultative interparliamentary organisation for the North Atlantic Alliance. Its current President is Madeleine Moon from the United Kingdom, elected in 2018. Its current Secretary General is David Hobbs from the United Kingdom; he has been in this position since January 2008. The Gas Exporting Countries Forum (GECF) is an intergovernmental organization of 11 of the world's leading natural gas producers made up of Algeria, Bolivia, Egypt, Equatorial Guinea, Iran, Libya, Nigeria, Qatar, Russia, Trinidad and Tobago and Venezuela. GECF members together control over 70% of the world's natural gas reserves, 38% of the pipeline trade and 85% of the liquefied natural gas (LNG) production. The three largest reserve-holders in the GECF – Russia, Iran and Qatar – together hold about 57% of global gas reserves. The 2006 Riga summit or the 19th NATO Summit was a NATO summit held in the Olympic Sports Centre, Riga, Latvia from 28 to 29 November 2006. The most important topics discussed were the War in Afghanistan and the future role and borders of the alliance. Further, the summit focused on the alliance's continued transformation, taking stock of what has been accomplished since the 2002 Prague Summit. NATO also committed itself to extend further membership invitations in the upcoming 2008 Bucharest Summit. This summit was the first NATO summit held on territory of a former USSR republic. The 2008 Bucharest Summit or the 20th NATO Summit was a NATO summit organized in the Palace of the Parliament, Bucharest, Romania on 2 – 4 April 2008. Among other business, Croatia and Albania were invited to join the alliance. Macedonia was not invited due to its ongoing naming dispute with Greece. Georgia and Ukraine had hoped to join the NATO Membership Action Plan, but the NATO members decided to review their request in December 2008. The 2004 Istanbul summit was held in Istanbul, Turkey from June 28 to June 29, 2004. It was the 17th NATO summit in which NATO's Heads of State and Governments met to make formal decisions about security topics. In general, the summit is seen as a continuation of the transformation process that began in the 2002 Prague summit, which hoped to create a shift from a Cold War alliance against Soviet aggression to a 21st-century coalition against new and out-of-area security threats. The summit consisted of four meetings. The Chairman of the NATO Military Committee (CMC) is the head of the NATO Military Committee, which advises the North Atlantic Council (NAC) on military policy and strategy. He is the senior military spokesman of the 29-nation alliance and principal advisor to the Secretary General. The Chairman is one of the foremost officials of NATO, next to the Secretary General and the Supreme Allied Commander Europe. He is assisted by the Deputy Chairman, who advises the Deputy Secretary General and serves as the principal agent for coordination of nuclear, biological, and chemical matters for the Military Committee. NATO–Russian relations, relations between the NATO military alliance and the Russian Federation were established in 1991 within the framework of the North Atlantic Cooperation Council. In 1994, Russia joined the Partnership for Peace program, and since that time, NATO and Russia have signed several important agreements on cooperation. According to Vladimir Putin, he proposed the idea of Russia joining NATO to President Bill Clinton in 2000 during a visit to Moscow, to which Clinton responded that he "didn't mind". The Union for the Mediterranean is an intergovernmental organization of 43 member states from Europe and the Mediterranean Basin: the 28 EU member states and 15 Mediterranean partner countries from North Africa, Western Asia and Southern Europe. 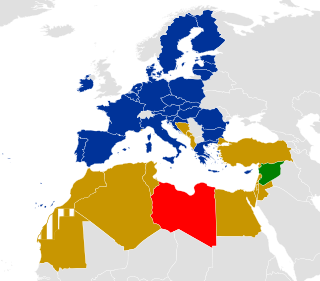 It was founded on 13 July 2008 at the Paris Summit for the Mediterranean, with an aim of reinforcing the Euro-Mediterranean Partnership (Euromed) that was set up in 1995 as the Barcelona Process. Its general secretariat is located in Barcelona, Spain. The 1957 Paris summit was the first NATO summit bringing the leaders of member nations together at the same time. The formal sessions and informal meetings in Paris, France took place on December 16–19, 1957. This was only the second meeting of the NATO heads of state following the ceremonial signing of the North Atlantic Treaty on April 4, 1949. The 1974 Brussels summit was the second NATO summit bringing the leaders of member nations together at the same time. The formal sessions and informal meetings in Brussels, Belgium took place on June 26, 1974. This twenty-fifth anniversary event was only the third meeting of the NATO heads of state following the ceremonial signing of the North Atlantic Treaty on April 4, 1949. The 2010 Lisbon summit was a meeting of the heads of state and heads of government of NATO held in Lisbon, Portugal, on 19 and 20 November 2010. The 2014 Wales Summit of the North Atlantic Treaty Organization (NATO) was a meeting of the heads of state and heads of government of the North Atlantic Treaty Organization, held in Newport, Wales on 4 and 5 September 2014. Such summits are sporadically held, and allow leaders and officials from NATO Allies to discuss current issues of mutual concern and to plan strategic activities. The 2014 summit has been described by US Navy Admiral James Stavridis as the most important since the fall of the Berlin Wall. The 2017 Brussels Summit of the North Atlantic Treaty Organization (NATO) was the 28th formal meeting of the heads of state and heads of government of the North Atlantic Treaty Organization, held in Brussels, Belgium, on 25 May 2017.